This is Part 4 of a 5-part series on eating our way through Vietnam. We spent three weeks in Vietnam, starting with Hanoi in the north, making our way down over 1,000 miles to Ho Chi Minh City in the south. See Part 1: Introduction, Part 2: Hanoi and Part 3: Hoi An. Due to transportation logistics, Da Lat (Đà Lạt) was not our next stop in Vietnam, but geographically it makes sense to talk about it after Hoi An (Hội An). Settled in the south-central highlands of the country and surrounded by nature, the region’s climate (the city boasts year-round spring weather) and altitude make it ideal for growing produce. You will find everything from coffee beans, strawberries, artichokes, flowers, wine… the list goes on. Unfortunately, we visited Da Lat during Tết, the Vietnamese New Year, so many businesses were closed during the majority of our stay, making it a challenge to find the food we wanted to try. Not to be discouraged, we rode our motorbike up and down the hilly one-way streets many times on our mission. The climate, the nature and the fresh air are some of the reasons locals, and the French at one point, flock to Da Lat to escape the heat of the south. Da Lat is also the top spot for Vietnamese honeymooners; some say it doesn’t count if you go elsewhere. Bánh tráng nướng, also known as "Vietnamese Pizza"
We had read that bánh tráng nướng, also known as “Vietnamese pizza”, is a delicious snack unique to Da Lat, but the first time we ate it we were totally turned off. The flavors were all over the place and it just didn’t seem to make sense; we tasted shrimp, hot dog, hot sauce – what is going on?, we wondered. Fast forward to a few nights later when we were riding around looking for food and passed Bánh Tráng Nướng 112, a shoe store during the day and eatery at night, which Prem had read about so it caught his eye. We decided to give the pizza of Vietnam another try, which turned into three orders in one sitting. This place knows what they were doing. Rice paper is grilled over hot coals, topped with a beaten egg and then the ingredients of your choice. This spot has over a dozen variations, including cheese, sausage, paté, dried shrimp and spring onion; our favorite became “everything” (is our New York showing?). The completed grilled item is served on a plastic plate with scissors for cutting it into slices and bowls of chili sauce on the side for dipping. The rice paper is so thin that it’s easy to share a few in one sitting before getting full. In Ho Chi Minh City we tried bánh khọt, bite-sized pancakes made from a combination of rice flour, turmeric and coconut milk, topped with shrimp. In Da Lat we found bánh căn, similar in that it’s another bite-sized rice flour treat, but in this version a quail egg replaces the shrimp as protein. We watched ours be cooked in terracotta molds right over the hot coals: each pod is filled with batter followed by one quail egg before being individually covered for a few minutes to cook. They were served with a dipping sauce full of herbs plus two meatballs. These little guys make a nice snack in between meals. Nem nướng literally translates to “grilled sausage”, but there is oh so much more to this dish than just the pork when it’s served as a meal. We talked about eating nem nướng in Hoi An and had a similar experience in Da Lat. We rode up to Ánh Sáng, a narrow street full of local eateries, on our motorbike to find our destination just opening for lunch. We took a seat next to the grill at one of the empty tables out front, which quickly filled up with locals and tourists alike. A trip inside to use the restroom told us this family runs a dual business, not uncommon (see Bánh Tráng Nướng 112, above), as both an eatery and a printing press. Like most places in Vietnam there was no menu and only one option available. Shortly after sitting down, grilled homemade pork sausages, fried rice paper, julienned vegetables, shallots, fresh herbs, peanut sauce, chili sauce, chillies, garlic and rice paper were delivered to our table. Just like in Hoi An, one of the employees showed us how best to wrap all of the ingredients in a single rice paper before dipping it into the peanut sauce, made spicier by some chili sauce, if you wish. We were grateful for the lesson on rolling, because we saw how to find the right balance of ingredients and could taste that balance in the final product. This meal was one of our favorites, and like many dishes in Vietnam, didn’t feel too heavy thanks to the abundance of fresh herbs and vegetables. Nem Nướng Đơn Dương has been around for about a year. The woman in charge didn’t speak much English, but she was enthusiastic and said ohhhhh-kay to pretty much everything we asked or said. Accompaniments to our "broken rice"
This dish literally translates to “broken rice”. The rice is damaged during milling resulting in a cheaper but perfectly edible grain. It’s typically served as cơm tấm sườn nướng, with grilled pork, meatloaf, pork floss, fried egg and pickled vegetables, which is how we enjoyed it in Ho Chi Minh City (more on that later) and also at a not-worth-mentioning eatery in Da Lat. In Da Lat we also enjoyed a different kind of feast surrounding cơm tấm at a local spot where a large variety of vegetables and proteins are available to accompany your steaming bowl of broken rice. We had a hard time not over ordering but ended up with sườn nướng (grilled pork), bông cải xào bò (cauliflower stir fried with beef) and cá kho tộ (claypot fish in a sweet sauce). Since there were only two of us, we ordered a đĩa (plate) of each, instead of a phần (sharing size portion). Go hungry. After reading references to the dish in Andrew X. Pham’s beautiful memoir, Catfish and Mandala, Prem was surprised we didn’t encounter this dish earlier. So when we came across it at lunch one day we had to order it. In Vietnamese cuisine, kho refers to a cooking technique meaning “to braise”. A simple, comforting dish, fish (often catfish, or cá tra in Vietnamese) is braised in a caramelized sauce of nước mắm (fish sauce), garlic, shallots and ginger. The heavily reduced sauce is rich, sweet and savory. Mì Quảng is another dish we talked about in Hoi An, but our experience in Da Lat showed us that there’s no one way to make this soup. At a storefront that looked like it was also functioning as a convenience store, we grabbed seats at one of the busy tables out front. Our dish of yellow noodles, broth, peanuts and sesame rice crackers (bánh tráng mè) had a big fat pig trotter replacing the shrimp, which had seemed more common in Hoi An. The pork meat was so tender it came off the bone. This hot bowl of soup was perfect for a chilly Da Lat evening. It was during this meal that we got a simple tip on hygiene from a local high schooler: always wipe down your chopsticks and spoons with lime, or at least a napkin, before digging in. Bún bò Huế is a beef noodle soup (bún bò) in the style of Huế, a central Vietnamese city that used to be the country’s imperial capital under the Nguyễn dynasty. The beef bone based broth is accentuated with lemongrass. Ours came served with beef shank, crab and pork meatballs and, similar to bún riêu, seasoned with mắm tôm (fermented shrimp paste). If you want the congealed pig’s blood, ask for huyết. Kuy teav traces its origin to ethnic Chinese people settled in Southeast Asia, particularly Cambodia. The large numbers of ethnic Khmer people in Vietnam brought with them hủ tiếu. Unlike several beef bone based broths in Vietnam, hủ tiếu is made using pork bones. The broth tends to be mild and clean-tasting. Most places serving hủ tiếu will offer you a choice of noodles: bánh phở (flat rice noodles), bún (thin, vermicelli noodles), mì (yellow, wheat noodles). The bún makes for a great textural experience, but we often found the bánh phở struck a better balance allowing for optimal broth and noodle slurping. One morning we biked around random alleys and streets using our nose and newly acquired Vietnam street-food sense to search for breakfast. Hoàng Diệu street seemed to have a lot of heavily-patronized spots. When we saw the crowd at Hủ Tiếu Hương, we realized we may have struck gold, or at least delicious pork, which our noodles came topped with. 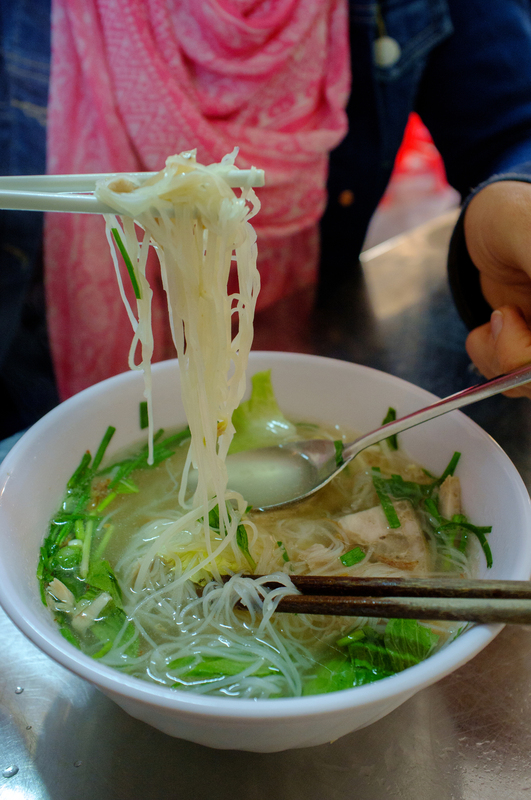 There is, of course, no shortage of phở in Vietnam. We had excellent phở bò in Da Lat, not far from where we were staying. The phở here was in the northern (Hanoi) style, which meant it was beefy, clean tasting and not sweet. Sữa Đậu Phộng simmering away. Pandan leaves add a subtle flavor and aroma. When I read that sữa đậu phụng was a drink that “goes down like hot, liquid peanut butter” I was on the hunt. We found it simmering away at the night market outside Central Market. The drink’s ingredients include soy beans, pandan leaves and roasted peanuts. It’s not as sweet as you might think, but the combination of the drink’s temperature and peanut taste was comforting on a cool night.